With over $14 million in cashes, Sam Greenwood is considered by many as one of the best. Sam Greenwood took down the $100,000 Super High Roller at the 2019 PokerStars Caribbean Adventure for $1,775,460 last week. Before that, he cashed in the inaugural PokerStars Players Championship (receiving $69,100 for his 49th-place finish) and today he cashed in the $10,300 Main Event (73rd, $20,980). He just jumped straight into the PCA $25,000 High Roller to try and see if he can claim his fourth cash in the Bahamas this year. Greenwood has been a staple on the tournament circuit for some years now, booking results all over the globe. Time for a quick review. Greenwood's first live cash, according to his Hendonmob profile, came in 2008 when he finished eight in the C$10,300 North American Poker Championship for C$87,490 ($77,447). 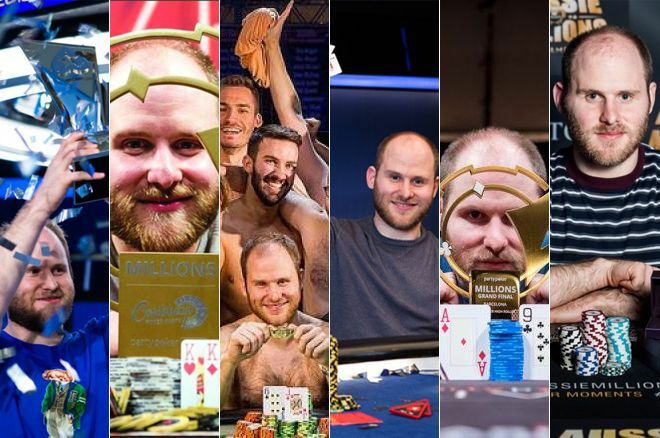 The first time Greenwood made a headline on PokerNews was when he lead the PCA $100,000 High Roller back in January of 2015. Greenwood would end up finishing sixth for $396,920; Steve O'Dwyer won it for $1,872,580. The first video interview we did with Sam was also in 2015 when Sarah Herring discovered him to be somewhat of a movie buff. (Sam's not-so-frequently-updated movie blog can be found here). While playing, and making the final table of a $100,000 Super High Roller in the Bahamas should tell you enough about Sam's poker prowess back in 2015, he didn't get onto the radar of the casual poker fan until he won a bracelet at the WSOP that year, beating a field of 1,915 in the $1,000 No-Limit Hold'em. He took home $318,977 and the bracelet, finally catching up with his brother Max Greenwood who won a bracelet in 2008. Sam in 2015: "I've made some money with poker and I'm just looking for opportunities to invest it. I'm an entrepreneur." While Greenwood was playing high rollers already at the time, he didn't call himself a poker professional when he won WSOP gold. "I'm a poker enthusiast," he told PokerNews after his bracelet win; "I'm an entrepreneur. I've made some money with poker and I'm just looking for opportunities to invest it. I'm an entrepreneur." From that moment on, though, Greenwood showed up at more and more events, raking in hundreds of thousands of dollars left and right. Later joined by his brother Luc Greenwood, Sam traveled the world and would usually be the first to sit down when a (Super) High Roller was set to get underway. In 2016, Greenwood shared with PokerNews how he thought WSOP tournament director Jack Effel mishandled a situation. A year ago, Sam Greenwood took to twitter to make his displease with the German poker contingent in the Super High Rollers known. Other than that, Greenwood's name is usually only heard when people discuss who's the best of the best. Playing online on PokerStars as "Str8$$$Homey," Sam has been crushing the highest stakes online for years. According to the PokerStars Blog, Greenwood has multiple COOP titles to his name. All live poker data courtesy of TheHendonmob.com.